Finished recapping the Capstan Speed Control (forgot to take pictures, damn it!) and the -12V rail is restored. However, the capstan and take up motors still spin upon power on. I was testing some transport functionality, so the machine was on for a few minutes and IC 3 on the pre-divider started smoking. It’s cracked, and I don’t know if that’s a fluke/wear, or a failure that caused it to overheat. Anyway, I’m not sure that has anything to do with the motors spinning. Recap tally: PSU, all 3 motor control boards (suppression caps), transport, capstan speed control. The counter isn’t recapped, but I don’t think that could be it. It feeds (or gets a signal from) the transport, so maybe that’s why the motors are spinning? Maybe the motors’ transistors are gone? I guess that could be an easy test since one motor isn’t spinning, and they all use the same transistors. Yesterday I started with the F-30. It needs a new nut, which is why I started the work on it that led to it falling and cracking. The previous nut had a shim glued to it, and that’s a real pet peeve of mine. 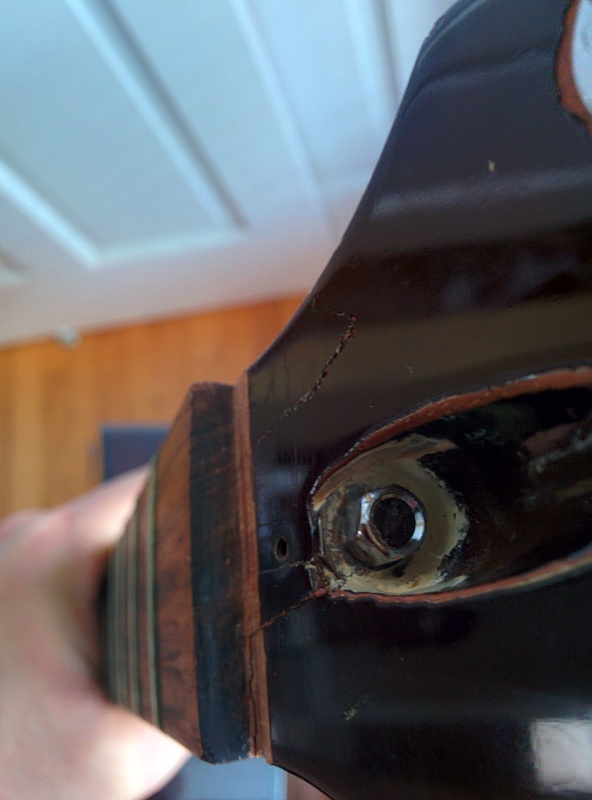 If the slot is too deep, then that happened because someone put glue at the bottom of the nut, so when it was taken off last, it pulled some wood with it. Then someone leveled the slot and as a result the slot became deeper. The quick solution is to shim the nut, which is usually done with whatever piece of wood is at hand. 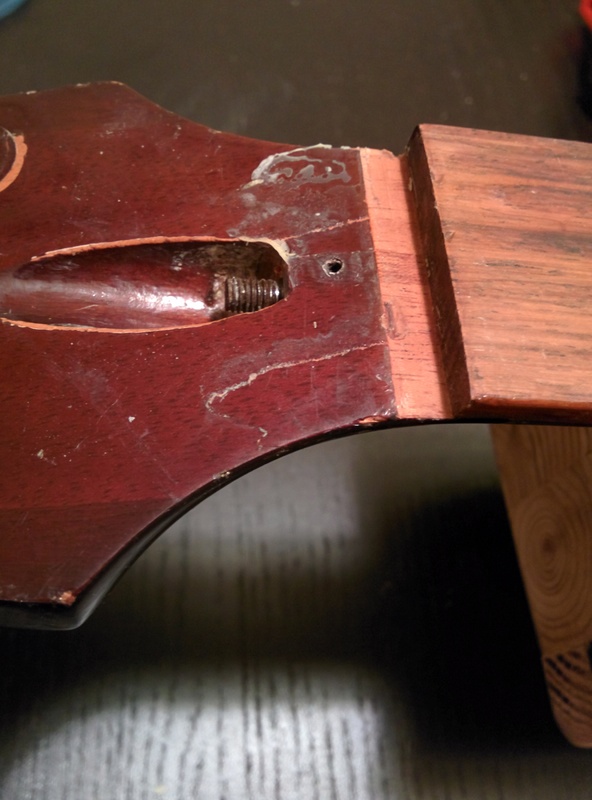 The appropriate solution (in my opinion) is to restore the original depth of the nut slot. So this whole preamble is to say that the slot is too deep on the F-30 and I was going to put a shim there to bring it to its original depth. 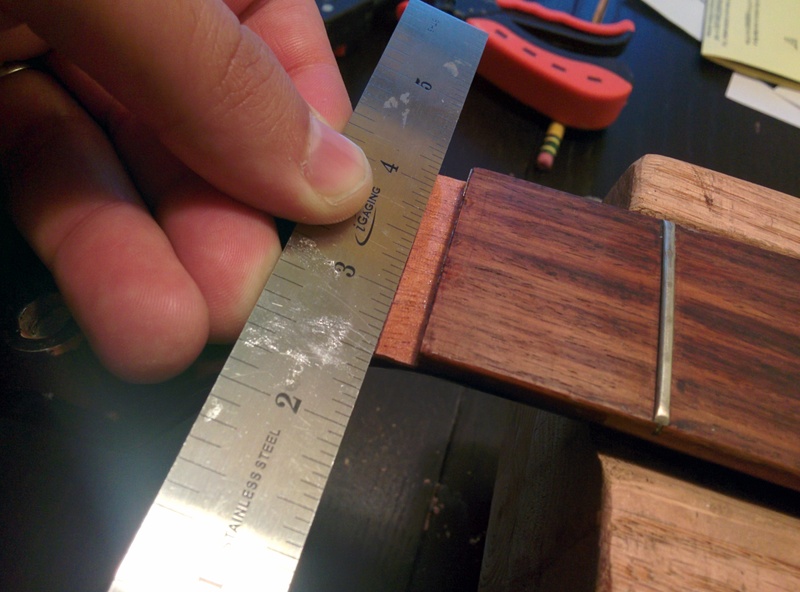 The original depth is so that the bottom of the slot (which is the neck’s mahogany), is at the same height as the bottom of the fretboard. I’ve cut some mahogany shim blanks before because I needed one for my S-300. Thinning these are always a problem. It’s not easy to rub them on sandpaper and get them flat – the fingers put an even pressure so they get all lumpy. But I figured out a way! 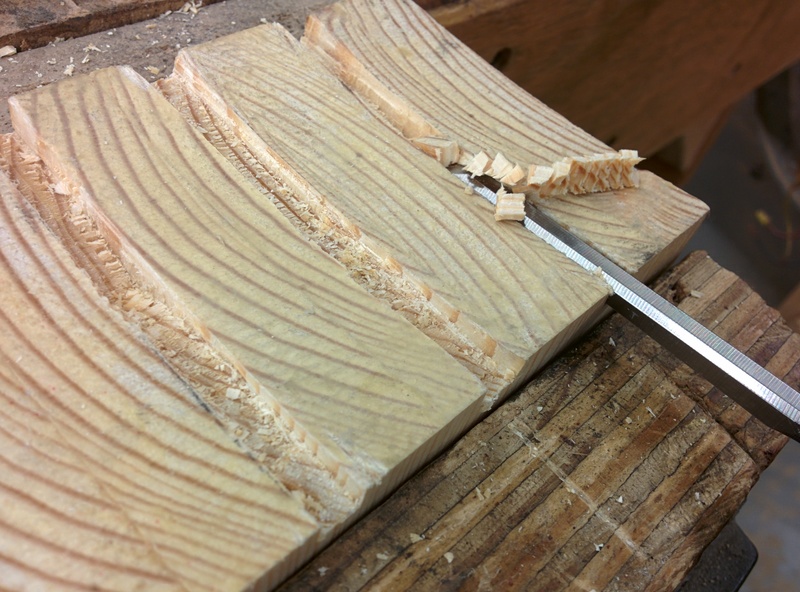 I’ve already fitted a nut blank to the slot – just the thickness and flatness of its bottom. I stuck 320 grit sandpaper to its flat bottom, laid the mahogany strip on top of sandpaper that is on top of a granite blank, and sanded away. This way the mahogany was held in place by the sandpaper on the bottom, and it helps that the bottom sandpaper is coarser grit. I also used the bone blank + sandpaper combo to flatten the slot before gluing the shim. Or better yet, use something like an old debit card so my fingers don’t get in the way of clamping. Should be done with this guitar very soon. I’m very excited. While that was drying I started recapping the Capstan Speed Control board. First cap out was C17, a 220uf 3V tantalum. I tested it for continuity and it wasn’t shorted! I didn’t have the right tantalum on hand (I thought I ordered one), so I replaced it with an electrolytic. I wrote before about how electrolytics seem to be a better alternative to tantalums now, but since my electronics knowledge isn’t 100% (far from it), I’m not sure it’s fine for all applications. I definitely don’t want to throw in the wrong capacitor in a circuit that is “time-sensitive” like the Capstan Speed Control. Anyway, it’s a Panasonic FM series cap that has a 56 mOhm impedance, so it should be fine. I hope. Next I pulled C20, a 100uF electrolytic. That’s the cap that sits between the -12V rail and the 0V rail, and it was short! Problem (most likely) solved! Then my wife came home and we had to go to dinner, so I had to stop. Over the last couple of weeks I noticed the RH inside drop by about 20%. When I glued the F-30 it was 58%-60%, today it was %42. I’m in Chicago and I assume everywhere in the Midwest and maybe Northeast saw a similar drop. I try and keep my acoustic guitar at 50% (in its case), and I keep a big bowl of water on the radiator that’s the closest to where my electrics are. I use a Dampit, and also moist sponges in plastic soap boxes that I drilled holes in. I also keep a hygrometer in my acoustic’s case to monitor it. Finished recapping the transport. Tantalums were replaced with tantalums. The three electrolytics were replaced with three modern ones. I also reseated and cleaned a few ICs. Why not? That mod that was done – seems like someone tried to avoid rewind or record functionality when the machine was set to AUTO. Nothing in the manual matched that mod, so I jumped the broken traces. Forgot to take pictures, but it looks good! I also lubricated the switches with Caig’s F5, and they don’t squeak as much as they did. Put the transport back in the machine, fired it up, and god dang it – the motors spin, -12V rail pulled to 0, but the transport is reactive. Disconnecting “To Audio” and “To Transport” at the PSU gave back the -12V rail, and only the take-up motor was spinning. I disconnected the two at the transport the connectors that carry -12V to it, and the motors don’t spin but the -12V rail is still pulled to 0. That led me to think that maybe something is up with the wiring, because disconnecting the voltages at the PSU brought back the -12V rail, but disconnecting it at the transport did bupkes for that rail. Not sure why, but it the dawned on me to disconnect the Capstan Speed Control, and hey! -12V rail is restored, supply motor isn’t spinning (take-up was), and the supply behaves in accordance to the transport button. So I think something at the CSC board is pulling the -12V rail down. Will recap it next! 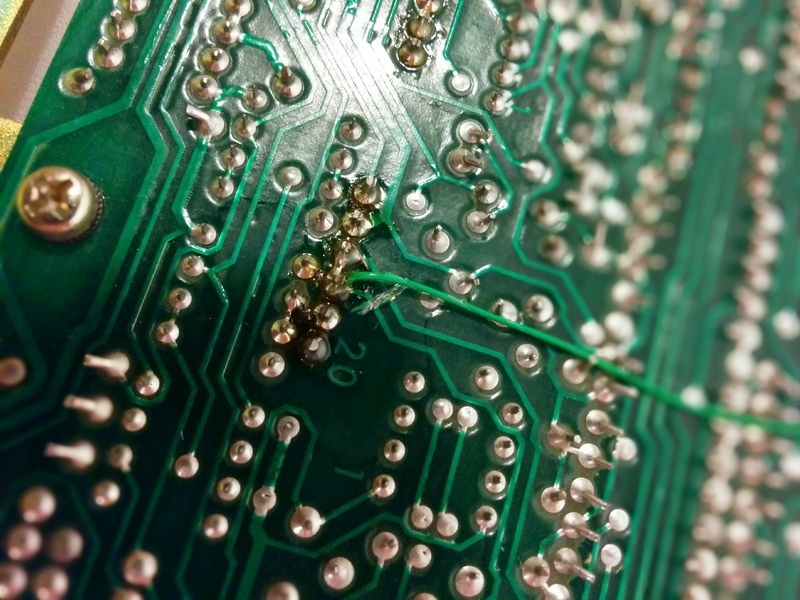 The traces were cut and the two pins connected together. Then they’re connected to some point under one of the switches. Doesn’t seem to be factory job because the soldering joint are a little amateurish (for instance, they left flux residue). I’m not sure what this mod is all about, so I’m taking the time to figure it out and see if I should reverse it or keep it this way. Meanwhile I replaced most tantalums. Like I said, they’ve been replaced before but I don’t know when, so I figured it’s worth it to replace them again. For a while I thought about replacing the tants with electrolytics. These tantalum capacitors are connected to ground (I assume to provide a low impedance path to ground for high frequency signals), and since they fail short, when they fail next they’ll pull the whole signal that’s passing through them to ground. I ended up not replacing them with electrolytics because I wasn’t sure they’ll work here, but I also don’t have any at hand and didn’t feel like ordering them and waiting, etc. I’m sure this isn’t the last time I’ll be poking inside this machine, so I’ll have other chances to replace these with electrolytics. 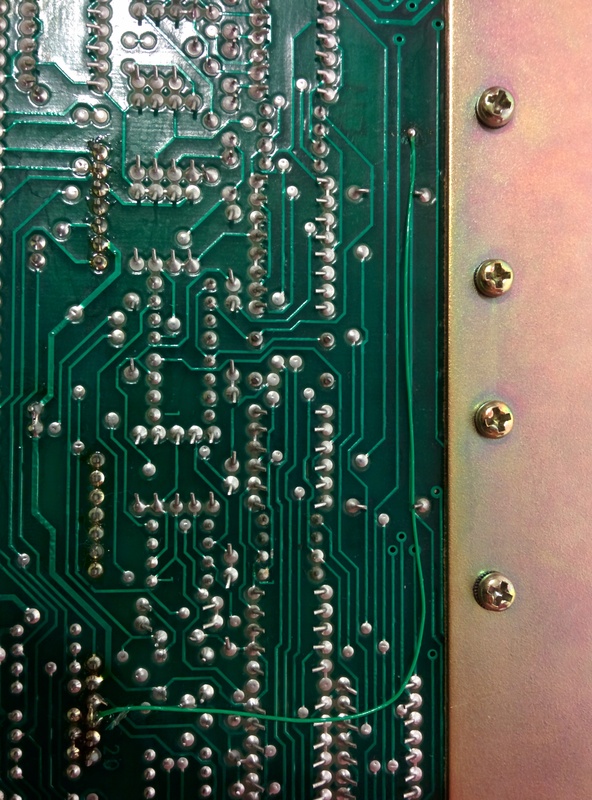 One last thing about the transport board – it’s thicker and has smaller solder points, so I had to change my tip and removing the old capacitors was a bit of a pain. 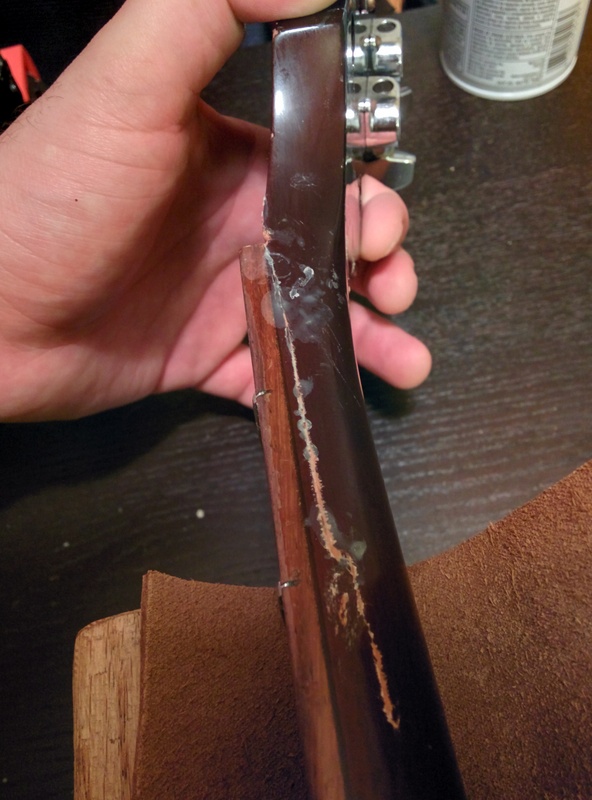 Guild F-30 neck and headstock crack repair – finally done! 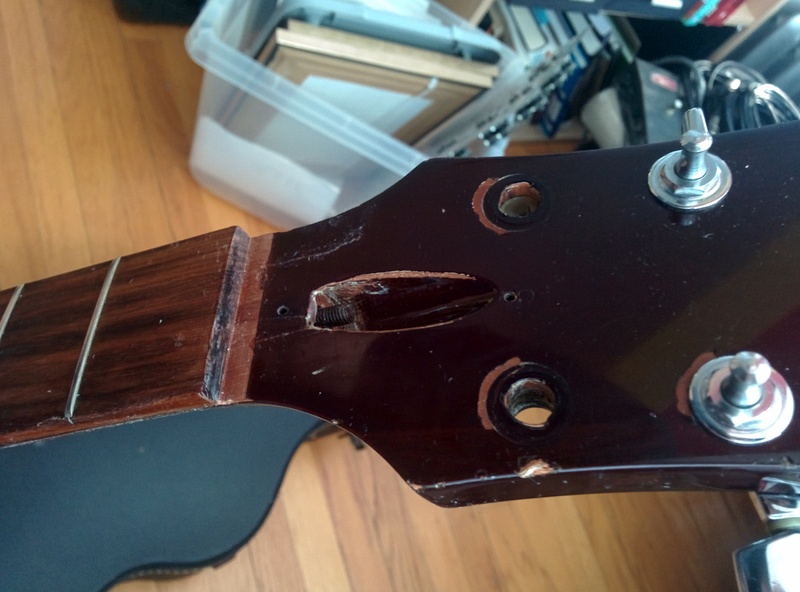 The “nice” thing about this break is that it wants to close under string tension, so it should have very little incentive to reopen. Gluing it was a matter of opening the crack, getting glue inside (not so easy), and clamping it. 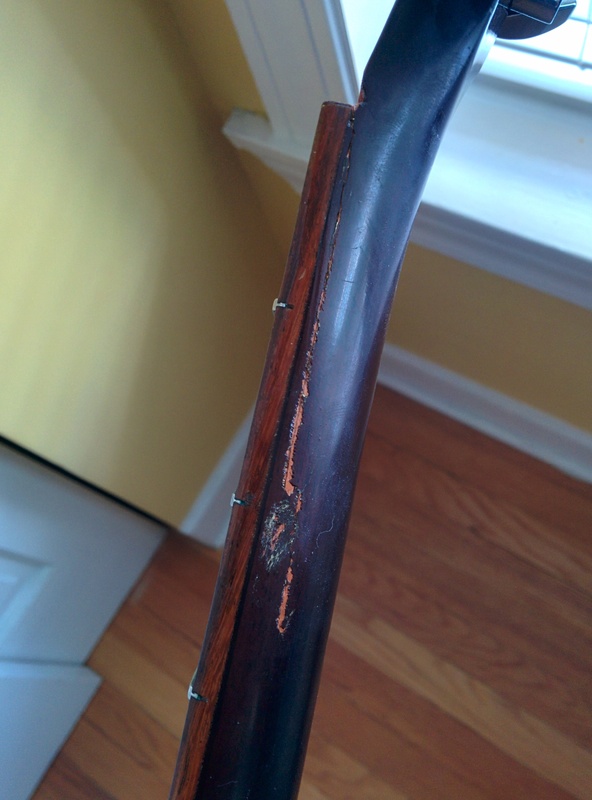 I was worried about gluing the truss rod in place, but I talked to a friend who works with this guy who was the foreman at Guild in the 80s, and he said that even if the rod is glued in place it won’t matter since it’s on the first 3 frets and the rod doesn’t do much work there anyway. As far as the gluing, the idea is to clamp the neck in a vise, use one hand to open the crack and the other to get glue in. 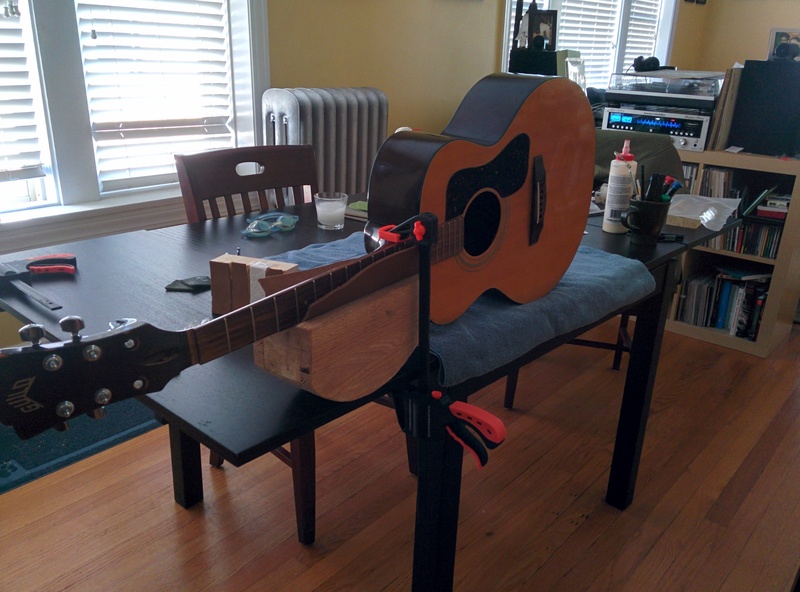 I don’t have a proper bench, or a vise, so I improvised and used my neck rest and a clamp to hold the neck in place. Sorry for the terrible back-lit photos. This wasn’t a bad idea, but the clamp was flexing as I was twisting the headstock, so you know, use a vise if you have one. People recommended to get the glue in with a syringe, or a syringe with a surgical tube attached, but those are too thick. So I went with a little syringe (a mistake). What I did first was get some hot water in the crack to help the glue spread inside. Then I would open it, get glue in there directly from the bottle, then with a syringe, then blow some compressed air in there. Those syringes have very thin needles with really small openings, so there’s not a lot of glue coming out of them. Also, the needles would bend and I had to keep changing syringes. So I wouldn’t recommend those, or at least fill them all up with glue first. I didn’t think the compressed air was getting anything further in the slot either. I would have been better off using a palette knife, thin feeler gauge, or this wide and thin brush that I have. It’s glued alright, though, I think. I didn’t practice clamping the thing enough. In fact, I never practice clamping all three areas together, which was a huge mistake. The problematic area was the nut slot. 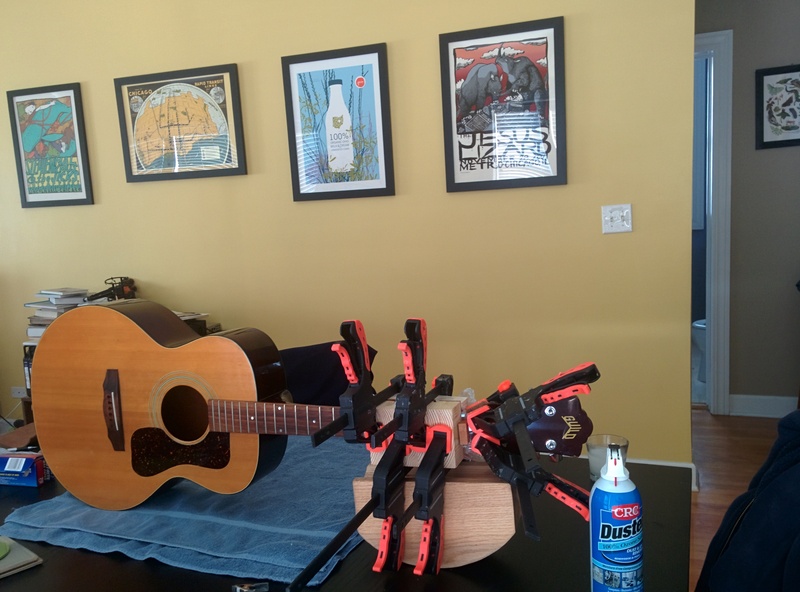 I tried a capo and I tried a pony clamp, but both were hard to fit there. 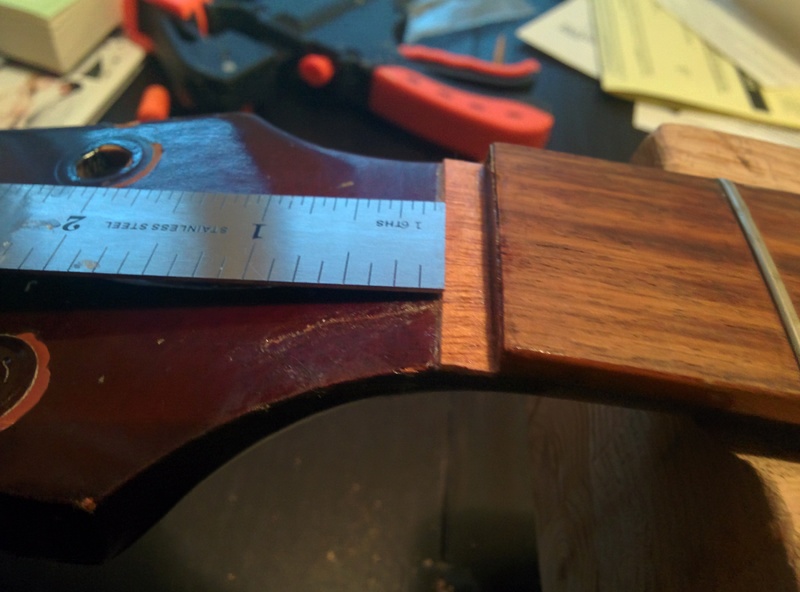 I should have clamped the nut slot first, then the neck, then the headstock. Luckily, the nut slot is a straight and level as it were before. That unopened compressed air bottle was my backup one. Humidity in the room was at 58% when I glued it up. It’s a little higher than what I would have wanted, but I had no choice. The glue I used was Titebond Extend. The headstock is glued perfectly. It’s flat just as it were before the break. The pictures aren’t pretty because there’s still glue there, but cleaned up it looks alright. The only problem is that there’s a ridge where the crack is. I don’t know if the wood swelled because of water/glue, or maybe it distorted when I clamped it? However, the neck doesn’t have a twist, so I’m happy with it and hope that the lacquer touch-up would diminish the ridge. 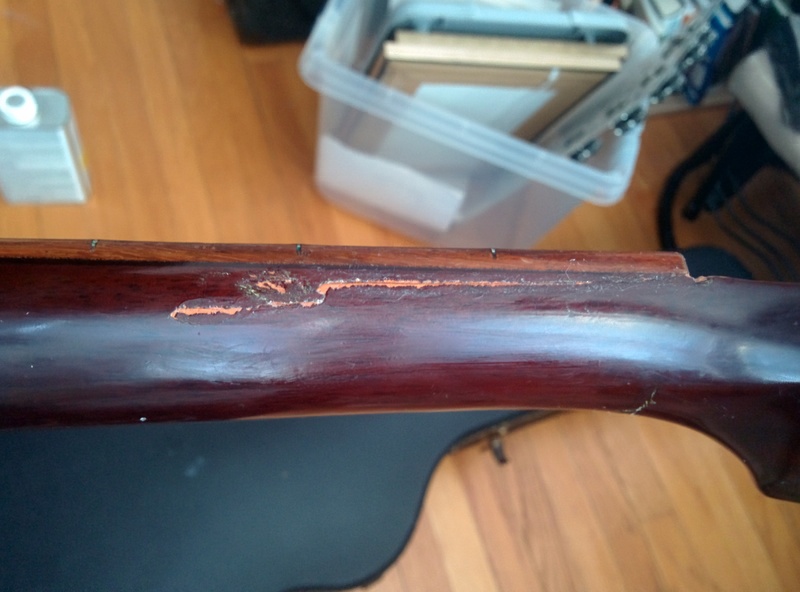 I cleaned up the glue and let the guitar rest for another couple of days before trying to flush in some CA glue. 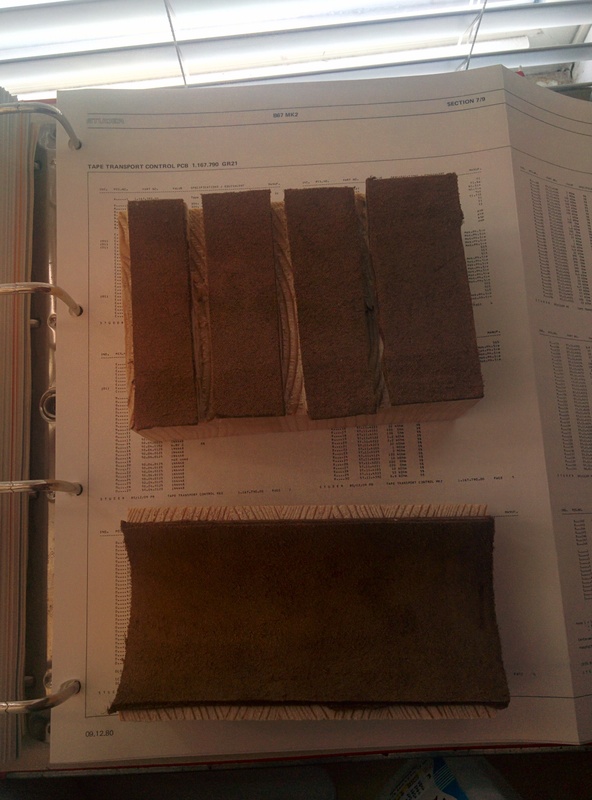 Wood glue has very different drying times when it’s not exposed to air. Think about it, the glue doesn’t dry when kept in the bottle. It needs to come in contact with air for it to dry. When you glue something and clamp it up, it can take the glue several days to fully dry. I know it sounds crazy, but I’ve put together a joint before, and then a couple of days later I took it apart and there was still “fresh” glue in there. 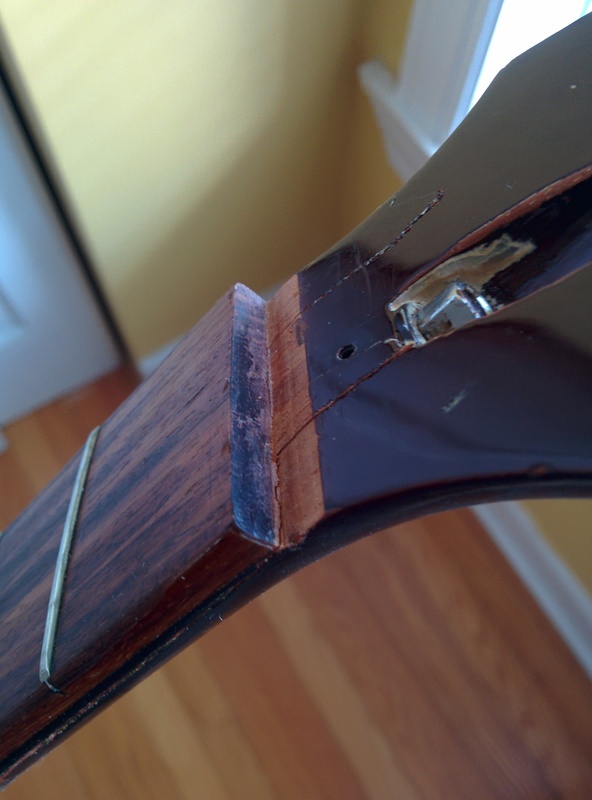 I don’t know how the CA will interact with fresh wood glue, so I prefer to let the guitar sit for a little bit. The glue was just sitting there and didn’t seep in, so I’m going to say the crack is glued tightly. I’m not too worried about the marks around the cracks because these will buff out once I touch up the finish. Now to finish cutting the new nut. Hopefully the guitar won’t fall off a stand this time. After a couple of months under string tension I’ll fix the finish. Maybe around the holidays when I don’t get to play it as often.